Pruning is the regulation of plant growth and productivity through branch removal and bud manipulation. Good pruning can help fruit trees become more resistant to pests and disease, as well as bear a larger, more consistent, and better quality harvest. Annual pruning is strongly recommended for best health and production of the more common pome and stone fruits (apples, pears, peaches, plums, cherries, apricots). Most uncommon fruits have less intensive pruning needs (see list at the end of this article). 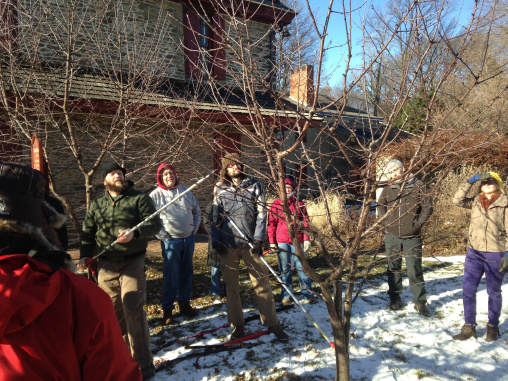 Winter fruit tree pruning workshop at Grumblethorpe historic house in Philadelphia. Removing dead and diseased wood helps prevent infection and the spread of disease. Pruning can improve both the quantity and quality of the harvest. The interior of unpruned trees tend to be too shady for good production. They may also demonstrate alternate-bearing: a large, low quality harvest one year followed by a very small harvest the next. Good shaping works with a plant’s natural growth habit to develop a strong primary structure that is able to support the full weight of harvests. 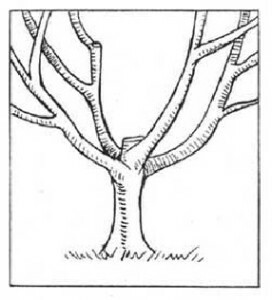 Encouraging good branch angles can prevent them from breaking in a storm or under the weight of fruit, which can tear deep into the trunk and endanger the whole tree. 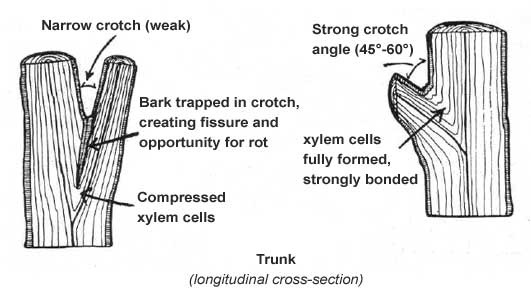 A narrow crotch angle is weak; at 17 degrees or less the bark gets pinched between the branch and trunk, trapping water and promoting rot. A crotch angle between 45 and 60 degrees is ideal, because the bark can develop fully. Pruning maximizes fruit production and health by controlling vegetative growth. Shoots, water sprouts, and vertical branches drain a tree’s energy. 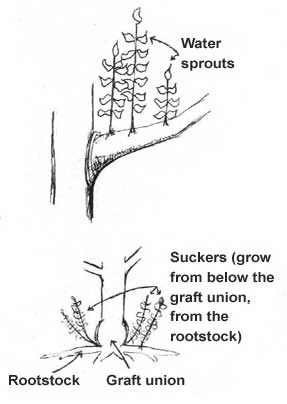 Suckers grow from below the graft union and divert energy from the grafted tree. Sunlight to the interior of the tree is essential for flower bud formation and fruit ripening. Increased air circulation to the interior can significantly reduce both development of fungal diseases and pest populations. How, when, and what to prune will depend on what type of tree you are working with. Be familiar with your tree’s growth habit (pyramidal, spreading, bushy, climbing, vigorous) so as to choose the pruning style best suited to the plant’s natural growth tendencies. Also learn about its fruiting habit; inadvertently pruning fruiting wood or specialized fruiting structures can seriously compromise a tree’s ability to bear fruit. See tree list at the end of this article for more information specific to different fruit types. Damaged and diseased wood, suckers and watersprouts should be promptly pruned, no matter what time of year. During active growing season, always sterilize tools with rubbing alcohol or a 10% bleach solution between each cut. A spray bottle is the easiest means of application. Most annual pruning should be done during the dormant season, before buds begin to swell, and preferably on a day when the temperature is above freezing (late January through early March in Philadelphia). Most tree diseases are dormant in winter, thus reducing the spread of infection. However, sterilizing tools is still good practice especially with trees known to be infected. Pruning cuts made in winter will also heal more quickly with the spring growing season to follow. Peaches should be pruned during or after they bloom in spring. Apples, pears, and grapes can be pruned earlier, starting in late December. 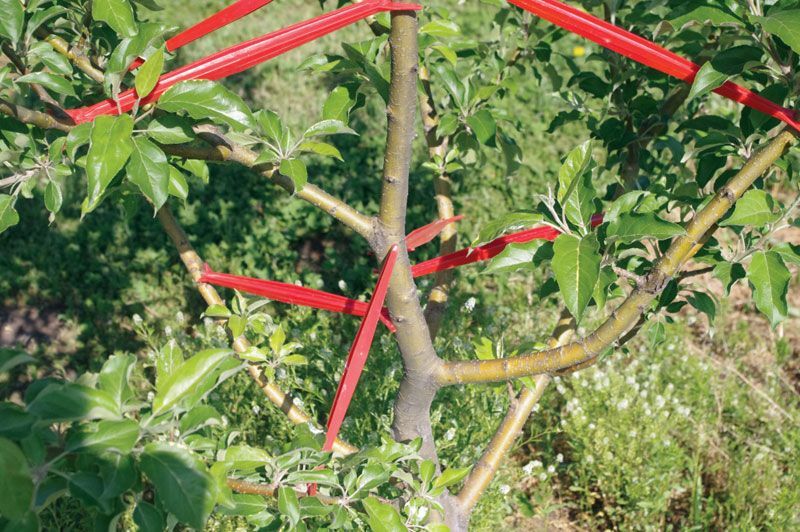 Espaliered fruit trees need both dormant and active season pruning to maintain their form. Thinning: To allow more light and air into the interior, cut branches back to their point of origin on the parent branch. This is a highly recommended technique and the type of cut used most often. Tipping/Heading: The opposite of a thinning cut in that it induces more side branching. Cut a branch back to a lateral bud heading in the direction you want the branch to grow. Make the cut ¼” above a bud (to allow for dieback) and at an angle parallel to the direction of the bud. Damaging Cuts – Do Not Use! Shearing: One of the worst things you can do to a fruit tree is to remove a set length from all of the outer growth, in which cuts fall randomly above and below buds. Shearing will cause a flush of dense, bushy growth, which is fine for hedges, but can ruin trees. Notching: By nicking vascular tissue above or below a lateral bud, you can determine whether a bud becomes a shoot or a flower. The nick should be close to the bud, about 1/8” wide, but not deep (a mere scratch – to cut the phloem just below the bark surface). It should reach halfway around the stem. To produce a shoot, notch above dormant bud, cutting off the flow of growth hormones from terminal bud. To produce a flower, notch below the dormant bud, sending the flow of carbohydrates from the leaf to the bud instead of the rest of the tree. Spreading, bending: Various techniques can be used to train branches to better, more horizontal angles. Hanging weights (molded concrete hangers, water bottles, etc,), using clothespins in late May-June, tying branches to ground or mouse guards, or using commercial or homemade limb spreaders to widen branch angles, will help make branches both sturdier and more fruitful. Always carefully bend branches partially to side, not down, to prevent breaking. Spreading and bending is especially important for trees with upright habits, including pears, apples, european plums, and sweet cherries. Commercial or homemade limb spreaders can be used to train branches to more horizontal angles. The central leader method is for trees with a strong vertical (conical, pyramidal) growth habit (apples, pears, European plums). Usually 3 tiers (whorls), each consisting of 4 branches, 6-9” apart, and spaced evenly around the trunk. The modified central leader is an alternate method for trees with a moderate vertical growth habit, recommended for sweet cherries and some apples and pears. 5-6 branches are left spiraling evenly up the trunk, 8-12″ apart, but the trunk is cut back to a main branch at 5-8′, and treated as open-center from that point. Vase or open-center is used for tees with a spreading, vase-shaped growth habit (such as peaches, Japanese plums, and pie cherries). 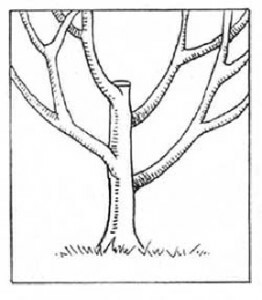 A whorl of 3-5 branches is left within 2-3′ above ground; any main trunk is cut back to the topmost branch. Note: As a general rule, avoid removing more than 30% of living wood in one growing season or there will be a flush of vegetative growth as the tree tries to replace the removed wood. If a larger percentage needs to be removed for some reason, consider summer pruning to minimize regrowth. Peaches are a notable exception in that up to 50% of living wood is removed every year. After removing dead and diseased wood, start with bending and spreading. Then, use thinning cuts primarily, and tipping or heading only to encourage lateral branching. Don’t prune off fruiting spurs on apples, pears, apricots, and plums. On peaches and sour cherries, thin the fruit-bearing wood by removing twigs under 4-6”. Keep the central area open by removing crossed, crowded, and inward growing branches. This increases light to interior and improves air circulation. Prune for branch strength by removing branches with acute crotches (less than 17 degrees between the branch and the main trunk). Encourage wider angles by training narrow forks through spreading techniques. Smaller branches. To remove a branch less than 1” wide you will make a single cut just outside the outermost ring of the branch collar. 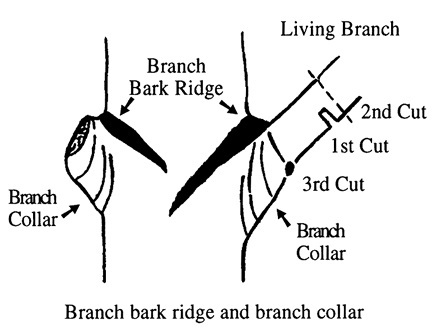 Start by locating the branch collar, which is a swollen area of compressed rings of bark tissue/wood at the base of a branch. 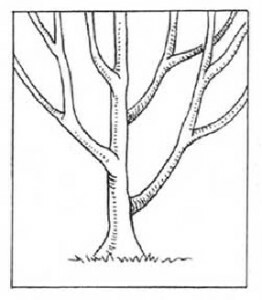 It is the point at which the growth pattern of the trunk overlaps that of the branch, strengthening the connection of the branch to the tree as new growth is added each year. Branch collar tissue is the tissue that heals and closes over the wound made by removing a branch. It is also a storehouse of phenolic compounds which prevent fungal diseases from entering the plant while the wound is healing. Use high quality tools and sharpen them before every pruning session. Bypass pruners and handsaws are the primary tools needed for young trees. Larger trees may require pole pruners, pole saws, or orchard ladders. Make precise cuts. Never cut into the branch collar. The proper cut may leave an unsightly wedge of wood, but cutting into the branch collar reduces the tree’s capacity to heal. Don’t leave a stub. If more than 1/8″ of wood is left outside the branch collar, the wound takes much longer to heal, because the healing tissue of the branch collar must grow out over that extra wood. This increases the risk of attack by insects and diseases. Always make a straight, flat cut. Do not try to sculpt the cut to the contours of the branch collar as you may accidentally damage the branch collar tissue. Larger branches. A three cut approach is best for pruning branches larger than 1” in thickness. Although the final cut should be made in the same location, just outside the branch collar, preparatory cuts are recommended to avoid the weight of the branch tearing down the side of the trunk and causing significant damage to the tree. Use a handsaw rather than a pruner to make cuts on larger branches. The first cut should be made on the underside of the branch, a couple inches out from the branch collar. Saw only a quarter to halfway through the branch. This prevents the weight of the branch from tearing towards the trunk on the second cut. The second cut should be made just beyond the first cut. Saw all the way through the branch from the top. This removes most of the weight of the branch. Make the third and final cut just outside of the branch collar, perpendicular to the branch bark ridge. Apple (Malus)- Preferred form depends on variety, but central leader or modified central leader works for most. Spreading/bending branches is recommended. Thin fruit to 5” apart. Apricot (Prunus armeniaca)- Open center or modified central leader. Thin fruit to 2” apart if necessary. Cherry, Sweet (Prunus avium)- Modified central leader. Head leader to create sidebranching. Cherry, Tart (Prunus cerasus)- Open center or modified central leader. Fig (Ficus)- In protected sites, can be grown as open center form. In spring, remove winterkilled branches. In exposed sites, wrapping or mulching may be needed for winter protection. Hazel/Filbert (Corylus)- Open center, with moderate pruning to stimulate growth. Jujube (Zizyphus)- Minimal pruning needed. Juneberry (Amelanchier)- Minimal pruning needed. Medlar (Mespilus)- Minimal pruning needed. Mulberry (Morus)- Minimal pruning needed. May be severely cut back to maintain smaller size. Pawpaw (Asimina)- Minimal pruning needed. Peach (Prunus persica)- Prune during or just after flowering. Remove up to 50% each year. Open center form. Thin fruit to 8” apart. Pear and Asian Pear (Pyrus)- Central leader or modified central leader. Spreading/bending branches is recommended. Thin fruit to 5” apart. Persimmon (Diospyros)- Modified central leader. Shorten long willowy shoots. Plum (Prunus)- Open center form, except for European varieties that prefer central leader. Thin to 2” apart on heavy bearing varieties. As with most tools, don’t buy the cheapest available! Quality tools will perform better and last longer.